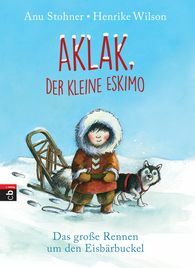 Aklak, the little Eskimo, is just like any other little boy; he goes to school every morning and lives in a house. The only thing is, his house is an igloo. And he also has very special friends, particularly Tuktuk, his well-behaved husky. What the friends like doing best is to ride on an ice floe pushed along by a whale, which of course is strictly forbidden.